Let’s Get This Business Started … Now! Collaboration and creativity were keywords for participants at the recent 3DS event held on the UH campus and organized by the Wolff Center for Entrepreneurship at Bauer College. University of Houston C. T. Bauer College of Business student Robert Dale Smith thinks remote controls are out of control. He has an idea for a technology start-up that would tie all of a consumer’s digital devices into a single, Web-based remote. That made the computer science and entrepreneurship student a perfect candidate for 3 Day Startup (3DS). Smith was one of 40 students who participated in the first 3DS hosted by the college’s Wolff Center for Entrepreneurship and staged on campus over the April 20-22 weekend. Founded in 2008 at the University of Texas, 3DS is an entrepreneurship program in which university students launch tech companies over an intense three-day session. In four years, 3DS has gone viral: More than 20 events on four continents have resulted in 16 companies and $4 million in startup capital. Organized by Bauer Professor Hesam Panahi, UH Bauer’s first 3DS was a 56-hour adrenaline rush that drew students from around the university — from business and communication to computer science and construction management majors. “A huge part of it is bringing together people from all parts of the school into one building,” the professor said. After its successful first outing, there’s hope that 3DS will become a vital cross-disciplinary exercise for UH students interested in technology and entrepreneurship. Bauer’s top-ranked Cyvia and Melvyn Wolff Center for Entrepreneurship is already home to Wolffest (a burger-business competition for WCE students) and CougarPitch (a university-wide elevator pitch competition). Dean Latha Ramchand attended the Sunday evening presentations and was wowed by the ideas. 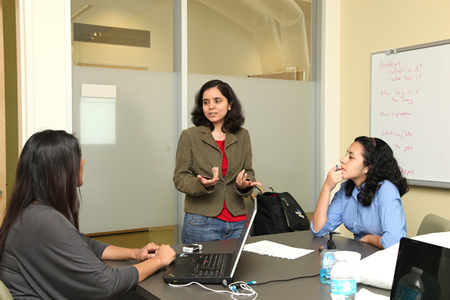 “It was a treat to see the magic that is created when you get students with ideas all in one room — Bauer students and students from engineering, the law school, liberal arts and all other colleges on campus came together over three days, brainstormed, did market research, wrote code, and created business plans that they can take to the next step,” Ramchand said. Besides Smith’s universal remote control idea (tentatively called Chromemote), 3DS produced ideas that would help consumers eat healthier (FeedMe), save better (PiggySteps) and dress smarter (IntelliGent). There was an idea for a website that would connect students with small businesses (Studentize) and a web application that would let music students (and parents and teachers) chart their progress (MuseTrack). Many of the teams plan to continue working together. The weekend began with brainstorming sessions in which dozens of pitches were winnowed down to the six most compelling. The 40 entrepreneurs then formed six teams, choosing team members with complementary skills. (Smith, for instance, needed help with programming, graphics and business.) Mentors from the local startup community were on hand to lend support. By Saturday, anyone who wasn’t writing code got kicked out to do market-validation research at local businesses. On Sunday night, the teams made their final pitches — this time in front of the public and a panel of investors and established top management from Houston’s startup community. Smith has been repairing computers since he was young. But he wants more out of his career. “My passion is really to contribute to advancing technology and not just fixing computers,” he said. That’s why his entrepreneurship certificate from Bauer and his 3DS experience are so meaningful to him. Click here to see more photos from 3DS at the University of Houston. Looks good. It is really meaningful.